The 2018 Toyota C-HR Review: Remember Scion? The junior, fun brand in the Toyota family that was supposed to be where young people made their connection with Toyota. It was born because back in 2003, some folks at Toyota believed that the youth of America saw Toyota as too old and stodgy. In 2017, Scion is gone. The brand died when it received too little exciting new product, and, more importantly, when Toyota’s leadership figured out that young people were buying Toyotas after all. You can acquire three former Scions rebadged as Toyotas, the Corolla iM, Mazda-sourced Yaris iA, and the 86 sports coupe (formerly FR-S). 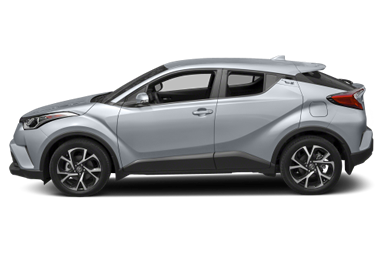 And the car that was originally meant to be the new Scion compact crossover has become the Toyota C-HR. My sample vehicle sported the two-tone paint you get when you order the R-Code option. The Radiant Green color, mixed with Iceberg (white) on the roof and mirrors, keeps things lively, and is only available as a two-tone. My tester was the XLE model. There’s also a Premium version that gets additional safety and styling updates, along with illuminated vanity mirrors and more seat adjustment choices. You enjoy the safety of Blind Spot Monitor and Rear Cross Traffic Alert, two features that are increasingly available standard on modern cars. In the Premium version the front seats are power adjustable and heated, and you get smart key with push-button start. Whichever model you pick, it’s a 3,300-pound car motivated by a 2.0-liter four-cylinder engine driving the front wheels. It churns out 144 horsepower and 139 lb.-ft. of torque through a continuously-variable transmission (CVT). CVTs aren’t designed for sportiness, but this one, called a CVTi-S, lets you select Sport mode and use paddle shifters to pick seven preselected “ratios.” That mitigates some of the oddness of the CVT sound, as it searches for the ideal ratio, but it may lower the efficiency. At least it’s more fun. EPA numbers are 27 City, 31 Highway, and 29 Combined. I accumulated 26.3 mpg. Green scores are only a 3 for Smog and a better 6 for Greenhouse Gas. The C-HR receives two Toyota-first features: Driver Distraction Secure Audio and Brake Hold Function. The first limits the menus you can view on the screen while moving, complying with driver distraction guidelines issued by the National Highway Traffic Safety Administration (NHTSA). Brake Hold keeps the brakes on slightly when the car is still, even if you reduce pressure on the pedal. That keeps you from rolling inadvertently, I guess. A full-electric car can do that already. 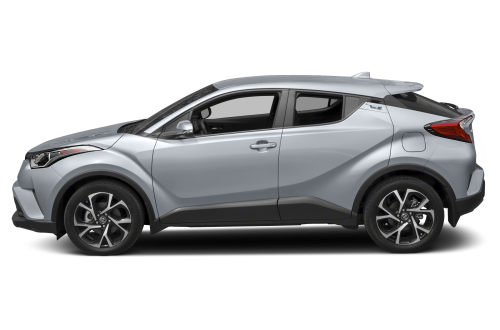 The Bottom Line: The 2018 Toyota C-HR would-be Scion C-HR is aimed at customers who want to have some fun, stand out a little bit in traffic, and don’t have lots of money to spend. The C-HR is not big, but with a rear hatch and 36.4 cubic feet of rear cargo room with the split rear seats folded, you can do a lot with it. That means the car is playing its new role right now, regardless of the brand or the badge it wears, and doing a very good job of being an entry level, fun to drive, value priced Toyota. And maybe, just for those reasons alone, you should “Drive one, Buy one, Today ©”.